The club Christmas party was a success. Quite a group showed up for fun and food - way too much food, as usual, but hey! It's Christmas! Altho it's not really an "event" this is a reminder that anyone can order a really attractive ham call carving. 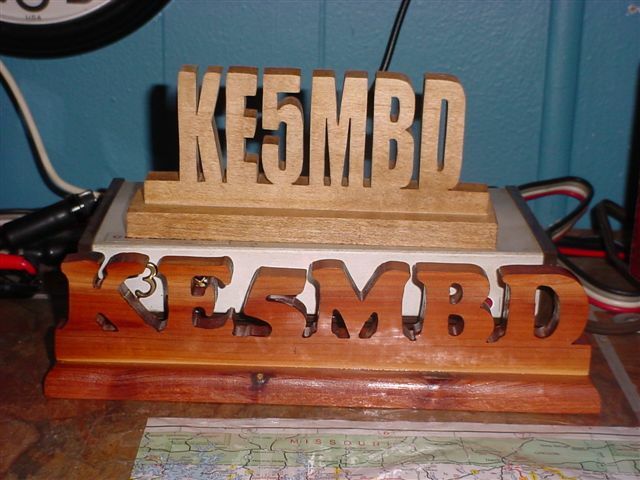 Bruce, KE5MBD provided information about some of the wood call sign carvings his son-in-law Ken May makes. The number to call for ordering one is 870-237-4001. Our club call, W5SCR, will be in QST! We placed 1st in the Arkansas section, 2nd in the Delta division, and 4th in the Southeast Region. Gotta give a lot of credit to Mark & Rusty! On March 1, a large group of club members and friends gathered at Rusty's shack again, this time for the international DX contest. 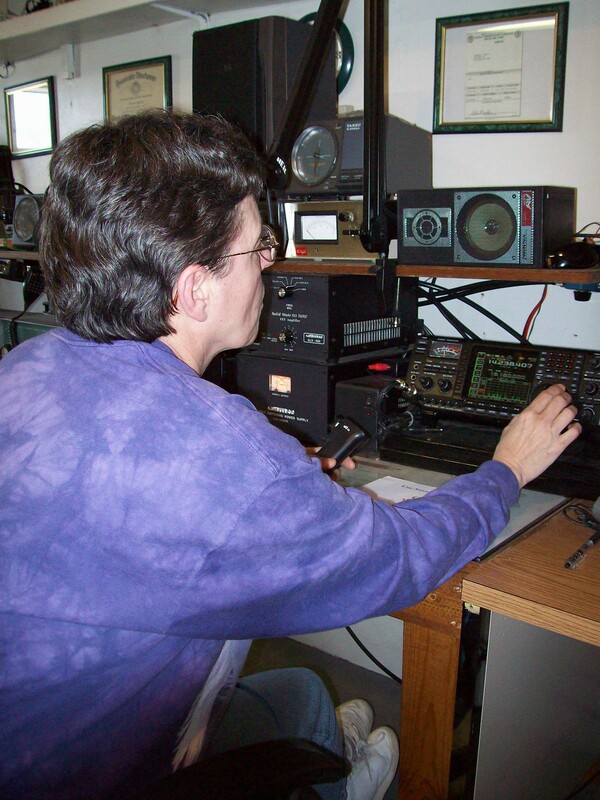 The club made quite a few contacts, and encouraged newbies to get on the air and try it out. Again, there was a lot of good food, a lot of good conversation, a lot of informal learning, and a lot of fun. The only one who didn't have fun was poor Rusty, who was sick! Below is a picture of club Pres, Sue, KD5LKG, drooling over some of the stuff in Rusty's shack during the contest. 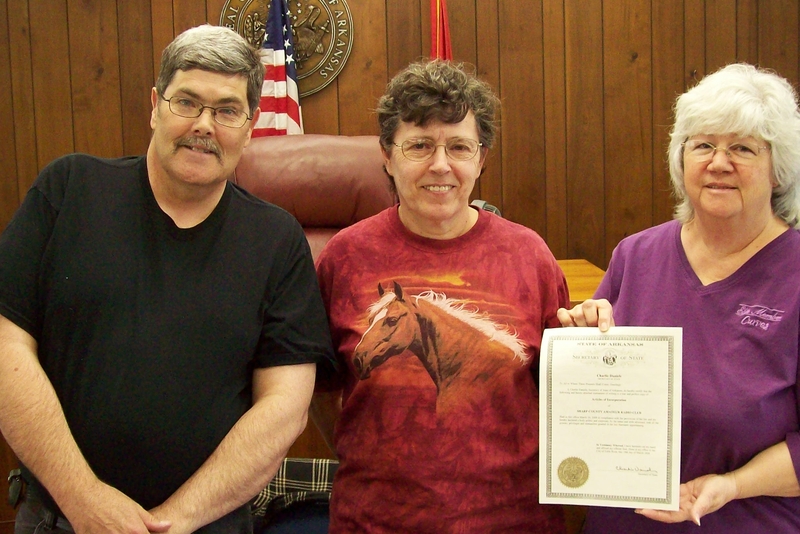 We are now incorporated! At the most recent club meeting, Treasurer Anne, KD5LKF, proudly displayed the official incorporation papers. Shown with her are President Sue, KD5LKG and Secretary John, KE5JDY. On June 7, 2008, a group of club members met at Nine Mile Ridge and walked the whole road picking up cans to raise money for the club. Don't know yet how much the cans will go for, but the weather cooperated, we got a lot of healthy walking in, and afterwards, had a nice picnic lunch! And, those handie-talkies came in handy!